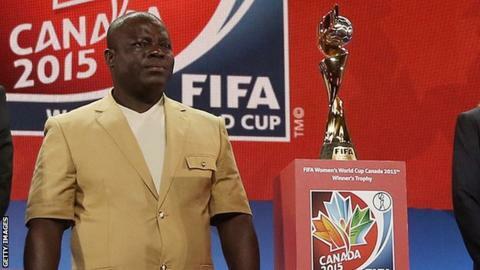 Coach Edwin Okon believes Nigeria can "shock the world" in the so-called 'Group of Death' at the 2015 women's World Cup in Canada. The African champions are drawn against two-time world champions, the United States, in Group D alongside Australia and fifth ranked Sweden, who conceded just one goal in 10 qualifying matches. "We qualified as African champions and that should worry the other teams in our group," Okon told BBC Sport. Nigeria is the only African team to have played in all Fifa Women's World Cup tournaments since 1991 but they have never gone past the quarter-final stage, a feat they achieved at the 1999 edition. Okon believes the side he now has at his disposal is better equipped than in previous years to handle the threat in their group and provide a challenge of their own at the showpiece event to be played from 6 June to 5 July. "We have a young squad with strong mentality and our opponents definitely respect us because we are not under pressure." he said. "Our ambition is to surpass the quarter-final stage of 1999 and my players are well aware that the pressure is on the supposed big teams to deliver. "Our squad is very strong, boasts of players who have played on a big stage, they fight for a common cause - and I think this mentality is important to us. "If we play our game, stay focused and with God on our side we will shock the world." Okon was appointed coach of the senior women's side after leading Nigeria's U-20 team to a fourth place finish at the U-20 World Cup in Japan in 2012. He led the Super Falcons to their record seventh African title when beating Cameroon 2-0 in the final of the African Women's Championship in October. Their overall record at the continental showpiece is a remarkable 36 wins and five draws in 45 matches.